Inductors (also called a coil, choke, or reactor) are components that consist of coils of insulated copper wire that are wound around some type of core at its center. They’re used to help block AC while allowing DC to pass. CET Technology offers a wide selection of Inductors to choose from. Browse our Inductors by type: Buck/Boost Inductors, SMD Power Inductors, Toroidal Inductors, Common Mode Chokes, Drum Core Inductors and more. Find the Inductor you need on the CET Technology website and request a quote online. Contact us to learn more about our inductors – we have the ability to manufacture inductors meet your exact requirements. CET Technology manufactures Power Chokes in stock and available for purchase. Request a quote on HF Series Toroidal Power Chokes on our website. CET Technology designs and manufactures PFC inductors for any application. PFC inductors are ordinary inductors attached in a circuit in order to adjust the power factor value, which helps obtain high efficiency and proper power transfer. Find PFC Inductors on the CET Technology website and request a quote online. Contact us to learn more about our PFC Inductors – we have the ability to manufacture PFC Inductors to meet your exact requirements. CET Technology manufactures surface mount power (SMD) inductors in virtually any standard size package. We can cross to any competitor’s part and often provide better pricing. Please call us today to discuss your requirement for Surface Mount Power Inductors. At CET Technology, we have the ability to manufacture SMD Power Inductors to meet your exact requirements. CET Technology offers a complete line of toroidal inductors with standard or custom inductance ratings and packaging. 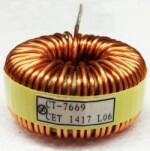 Find Toroidal Inductors on the CET Technology website and request a quote online. Contact us to learn more about our Toroidal Inductors – we have the ability to manufacture Toroidal Inductors to meet your exact requirements. CET Technology designs and manufactures common mode chokes in practically any size package or form factor for almost any application. Common mode chokes are power magnetics components used as an electrical filter to blocking high-frequency common mode noise while allowing differential signals and low-frequency common mode signals to pass through. Find Common Mode Chokes on the CET Technology website and request a quote online. Contact us to learn more about our Common Mode Chokes – we have the ability to manufacture Common Mode Chokes to meet your exact requirements. CET Technology offers a complete line of drum core inductors ( also known as bobbin core inductors) with both standard and custom inductance ratings; axial or radial lead outs; shielded or unshielded. The wires are wound around the inductor and the core typically has a cylindrical shape. Find the Drum/Bobbin core Inductor you need on the CET Technology website and request a quote online. Contact us to learn more about our drum inductors – we have the ability to manufacture drum inductors to meet your exact requirements. CET Technology designs and manufactures air coils in various form factors and inductance/current ratings. Air Coil inductors do not use a magnetic core made of permeable material. The term refers to coils wound on plastic, ceramic, or other nonmagnetic forms, as well as those that have only air inside the windings. Air coil inductors are primarily used for filtering applications, but also in antenna applications. Find the Air Coil Inductor you need CET Technology website and request a quote online. Contact us to learn more about our air coil inductors – we have the ability to manufacture air coil inductors meet your exact requirements.